Assoc. Prof. Libor Machala, Ph.D. 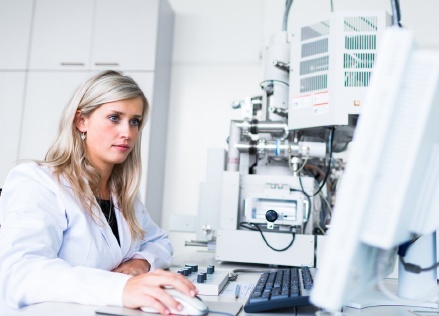 The group focuses on research in the field of nanocrystalline metal oxides, chiefly for biomedical applications and environmental technologies. 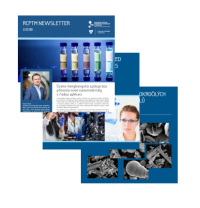 The primary focus is on developing magnetic iron oxide nanoparticles used as a contrast agent for magnetic resonance imaging, drug carriers for targeted transport in cancer therapy and in the magnetic separation of biomolecules and cells. 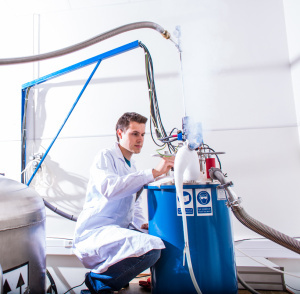 In the environmental chemistry area, the group works on developing new types of magnetic sorbents, environmentally friendly oxidants based on ferrates of alkali metals, and on magnetically separable catalysts. Also of importance is the study of biogenic iron oxide nanoparticles for biotechnological applications, thin oxide films for direct solar water splitting technology and magnetic nanoparticles as electrochemical biosensors. 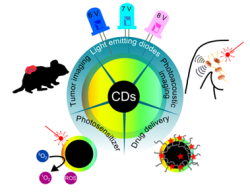 Hola, Y. Zhang, Y. Wang, E. P. Giannelis, R. Zboril and A. L. Rogach: “Carbon dots—Emerging light emitters for bioimaging, cancer therapy and optoelectronics”, NANO TODAY, vol. 9, iss. 5, pp. 590-603, 2014. Tuček, K. C. Kemp, K. S. Kim and R. Zbořil: “Iron-Oxide-Supported Nanocarbon in Lithium-Ion Batteries, Medical, Catalytic, and Environmental Applications”, ACS NANO, vol. 8, iss. 8, pp. 7571 – 7612, 2014. Zoppellaro, A. Kolokithas-Ntoukas, K. Polakova, J. Tucek, R. Zboril, G. Loudos, E. Fragogeorgi, C. Diwoky, K. Tomankova, K. Avgoustakis, D. Kouzoudis and A. Bakandritsos: “Theranostics of Epitaxially Condensed Colloidal Nanocrystal Clusters, through a Soft Biomineralization Route”, CHEM. MATER., vol. 26, iss. 6, pp. 2062-2074, 2014. Liu, X. Bao, L. Mao, J. Tucek, R. Zboril, J. Liu, F. Guo, Z. Ni and M. Tong: “A Chiral Spin Crossover Metal-Organic Framework”, CHEM. COMMUN., vol. 50, iss. 31, pp. 4059 – 4061, 2014. Magro, D. Baratella, G. Salviulo, K. Polakova, G. Zoppellaro, J. Tucek, J. Kaslik, R. Zboril and F. Vianello: “Core–shell hybrid nanomaterial based on prussian blue and surface active maghemite nanoparticles as stable electrocatalyst”, BIOSENSORS AND BIOELECTRONICS, vol. 52, pp. 159-165, 2013. Kuzmann, G. Zoppellaro, J. Pechousek, J. Cuda, Z. Klencsar, Z. Homonnay, J. Tucek, R. Szalay, M. Papai, L. Machala, and R. Zboril, “Ferromagnetic Coupling in an Fe[C(SiMe3)(3)](2)/Ferrihydrite Hetero-Mixture Molecular Magnet,” EUROPEAN JOURNAL OF INORGANIC CHEMISTRY, iss. 20, pp. 3178-3183, 2014. Markova, P. Novak, J. Kaslik, P. Plachtova, M. Brazdova, D. Jancula, K. M. Siskova, L. Machala, B. Marsalek, R. Zboril, and R. Varma, “Iron(II,III)-Polyphenol Complex Nanoparticles Derived from Green Tea with Remarkable Ecotoxicological Impact,” ACS SUSTAINABLE CHEMISTRY & ENGINEERING, vol. 2, iss. 7, pp. 1674-1680, 2014. The main applications of carbon quantum dots. Iron-oxide-based condensed magnetic cluster for usage in theranostic applications. Examples of composite systems containing iron oxide nanoparticles and carbon nanostructures.